Continuing with our ‘Recreate the Look’ series, here I show you how to recreate 1930s outfits for women, with modern reproduction clothing. 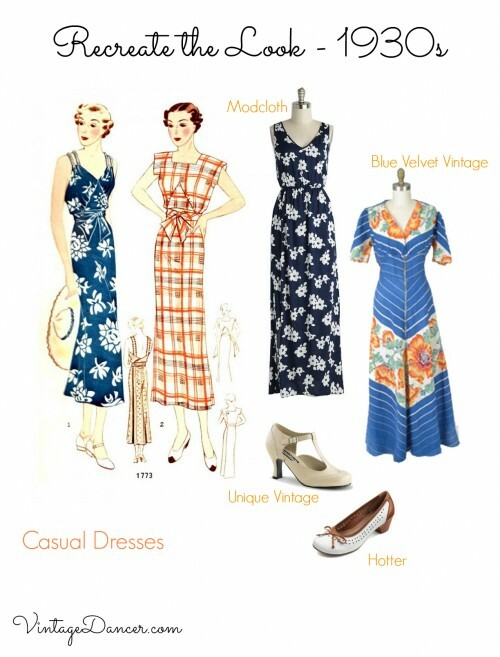 Original 1930s pieces can be difficult to acquire, but with a few hints and tips of the popular styles to look out for, a casual or dressy 1930s outfit can be styled with modern day clothing on offer from the retailers of today. The 1930s was a tremulous time. The decade ushered in with the 1929 Wall Street Crash, which in turn led to the Great Depression across America. The era then ended on an equally disquieting note with the advent of WW2 in 1939. This was definitely not the period of decadence and excess of the previous decade. The most widely recognized silhouette of the 1930s is long, sleek lines. Fashions were subtle, gone were the glittering beaded gowns of the Jazz Age. Even though the economic and political climate of the time was lugubrious, that is not to say that fashion and the appetite to be a la mode was dissolved. The ready-to-wear market, which began to be popular in the previous decade, started to expand in this time. Catalogs became popular, with women being able to muse languidly over pages of designs in the privacy of their own home. Advances in technology meant that film making grew enormously during this era, both in terms of the number of films produced, and the popularity with audiences. Film studios were big business, and fashion retailers soon realized that the cinema-goers appetite to emulate the looks of the latest MGM starlet converted nicely into sales. For the woman at home in the ’30s, there was the humble house dress. Developed in the early 20th century, it was a kind of ‘uniform of the home’. Early 1920s examples are more closely likened to aprons, whereas the 1930s incarnation more closely resembled a housecoat in design. Women wore house dresses whilst at home performing housework, cooking or cleaning. They often featured a wrap style of fastening or the newly popular zipper. Initially, 30s house dresses were one of only a few articles of clothing to utilize the zipper (or sliders as they were also known), although fashions soon adopted them as a convenient fastening method. House dresses of the 1930s. Recreate the look with these styles. The house dress was usually made from a durable but easy to clean fabric, such as cotton. The fabric was usually plain, but towards the end of the decade started to feature larger patterns. Today, a housedress need not be confined to the home, they are pretty, feminine and – due to the loosely fitted style – comfortable. Wear for a more relaxed ‘everyday’ take on vintage styling. Shop 1930s day dresses and shoes here. Linked to the quest for escapism in this trying decade, a new trend was born to be outdoors and active. Sun-kissed skin was coveted as it represented a seemingly healthy, leisurely lifestyle. Leisurewear was popular during this decade in its own right, but elements of the style also filtered into everyday fashions. ‘These daytime clothes have become more practical and more ‘sporting’ in every way.’ Stitchcraft August 1937.
Leisure wear grew in popularity in the 1930s. Style your own 1930s summer vacation clothes using these ideas. Shades of cream and white, sailor stripes and motifs were an especially popular choice, as it displayed ones tan to best effect. Women wore two-pieces, playsuits and loose 1930s pants in their pursuit of fresh air and sunshine. Pair playsuits and separates with round tortoiseshell sunglasses and a large straw sun hat for a 1930s look. As the ready-to-wear market expanded, so did the demand for versatile separates. Women were taking up employment, which meant their wardrobe had to provide them with options for daily wear, at an economical price. Separates such as blouses and smart skirts, could be made to look entirely different through the use of clever accessories. Blouse necklines could be dressed up or down with the use of removable collars and dickeys. Sewing pattern companies even produced patterns specifically for detachable collars, with the professional woman in mind. The fashionable silhouette of the era was a defined waist, narrow hips and broad shoulders. Here we can see the beginnings of the favored styles for the next decade. Overall subtle details prevailed, although the main focus of the style would be at the shoulders and neckline. Large bows sat high at the neck, caplets were worn to coordinate with the wearer’s outfit, and circular flounces of fabric adorned the shoulders. Even jackets and sweaters were cut so as to draw attention to the defined sleek waist and hips, in contrast to the dramatic shoulder and neckline details. This style is perhaps one of the easiest for us to recreate. Pair a sleek calf-length skirt with a neatly tailored blouse, adding a scarf at the neck for period detail. Enhance the look through the use of accessories – gloves, hat, handbag and smart heeled shoes. Continuing on from the popularity of holiday and leisure wear, beach pajamas were a popular item in a woman’s wardrobe during this time. Adapted from lounging pajamas, these were worn whilst promenading along the seafront. They often featured incredibly wide legs, which had the advantage of allowing the wearer to stay cool in hot weather, and of course, of being incredibly comfortable to wear. They were usually made from cotton, plain, striped, printed, sometimes with contrasting colors. Recreate the look with wide legged trousers and a loose fitting top in a coordinating color. Or, style a jumpsuit with a large straw brimmed hat and round sunglasses to emulate the 1930s. So comfortable, so fabulous. House of Foxy beach pajamas. An afternoon dress is a frock a woman would have donned instead of her house dress if she needed to leave the house. These were smarter and more fitted than a housedress, featuring more stylistic detailing. Early examples of afternoon or tea dresses would have been long and sleek, with the hemline hitting mid-calf. The waist would be defined through the addition of a belt, or clever fabric paneling. 1930s style dresses. Shop here. As mentioned previously, the focus of the dress would be on the neckline and shoulders, although the skirt too would have interesting subtle details. Skirts were cut on the bias creating movement and fluidity, and often featured pleats, panels in ‘V’ shapes or godets. As we move into the later years of the decade, the hemlines begin to rise to just below the knee. More fabric is utilized in the skirt, creating swing across the hips down to the hemline. In 1939, fabric may be gathered at the back of skirts – ‘Interest concentrates at the back of this model featuring the new ‘bustle’ line.’ Home Chat October 1939. For the perfect late 30s look, team one of these dresses with smart accessories.